There's a stump in our yard that's been there for years. It's from a sweet gum tree that was a sapling not much more in diameter at the base than my forearm when we first moved into our house in December of 1983. Sweet gums leaves are beautiful in fall. They turn the color of the setting sun in autumn before they fall. But the seeds pods look like medieval spiled ball weapons. Another downfall (no pun intended) is that the limbs tend to break off in high winds. When this one stood tall, part of the top sheared off in the wind and fell onto the back deck. Had it fallen on the roof, some of it would have punched through. That was in 2004. Rather than have the treen come down on the house in the next storm, we chose to have it cut down. The tree guy was going to cut the tree off at ground level, but we fancied ourselves using the stump as a support for a table. We imagined ourselves grilling steaks with our friends and dining around our table with the sweet gum base. It would b a conversation piece. The table never happened. I did set glasses of merlot on it while I grilled, but the table thing was on a low-priority todo list. 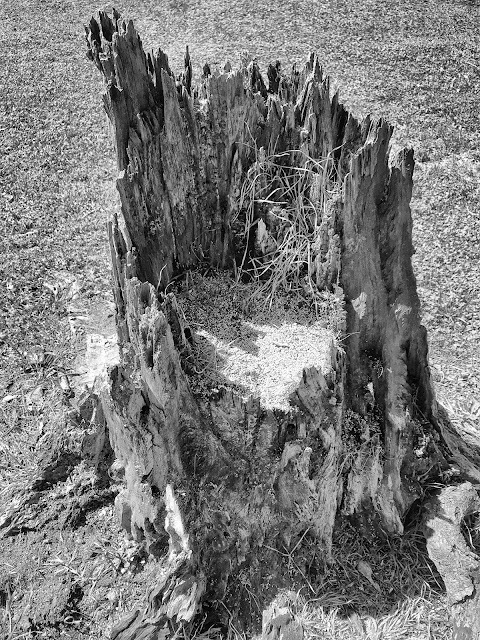 The stump looked as if it would be solid forever. But then Mother Nature began the slow reclamation process. I've taken pictures of the stump a few times in the past, but last Winter, Jilda started using the hollow part as a bird feeder. We have fancy feeders that we've paid good money for, but the birds seem to prefer this stump feeder. It's soft enough now that I could push it over to the burn heap with the tractor, but it's interesting to watch Nature do its thing. 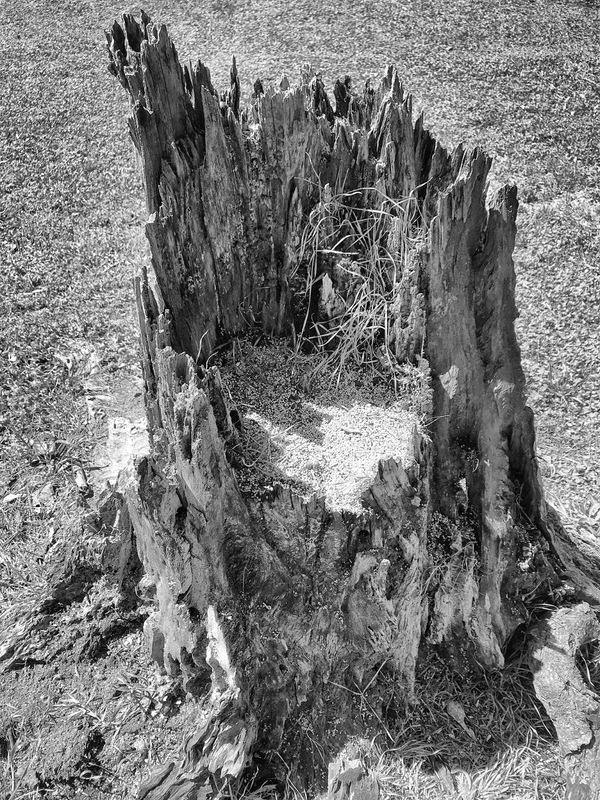 Ashes to ashes, stump to dump. We call sweet gums 'liquid amber' and ours is spreading those vicious spiked weapons with gay abandon at the moment. And shortly will blaze with glory. Love the idea of using the stump to feed the birds. For the closing 26 years of my public gardening career, I was assigned to a high school that suffered from these beautiful trees. Not only do they fly apart in high winds, but their spiky seed-pods float! This means they fall in the rain and float to gutter-drains, plug them up and the gardener arrives at 6 a.m. to flooded streets. I'd have to hustle far before humanly possible to rake those things out of drain-grills so people wouldn't hydroplane on their ways to work. 6 a.m.! When I retired, I was overjoyed to learn there is no such hour. Great idea for a bird feeder ! Trees are wonderful. I love them for their beauty and particularly for their shade in the summer heat, but they do a lot of damage when they decide to come down. Glad this one came down on the deck and not the roof. Wishing you both a very Happy Easter! A very good natural container. It could hold bird seed or flowers. I transplanted a serendipity lupin seedling in a rotting stump in the back of the hedge, and last spring it was blooming. Sweet gums produce the love hate syndrome... Love the leaf color hate the spiked rain! I know for sure. We once had a yard full of 'em. About 8 big'uns! Happy EAster to your TWO! Fascinating. We have the remains of a tree trunk in our front yard not too far from the sidewalk. A couple of years ago some sort of bees began to nest in it. Someone stepped in it and upset the bees. Guess who got stung. It burned like anything. It is being dealt with this month.